Great design is more than what is aesthetically pleasing to the eye. It is valuable to talk to specialists when designing and selecting finishes for your home. They will ask you deeper questions regarding how you live, not only “what do you like the look of?" Trish and Carlton delve into the small details, they go over and above expectations to really care for their client’s needs. They believe it’s not the devil that lives in the detail, it’s the comfort, desire and serenity that live there. The Baum home is one of the many home interiors Carlton assisted designing in 2016. Much care is put in behind the scenes when helping people create stylish spaces, we take a look in detail to why Carlton and the clients chose the surfaces and bathroomware in this beautiful local Cable Bay home. The initial brief from the clients was open to explore, they wanted to be presented with "the wow factor." Carlton therefore ensured no detail was skipped in the finishing of this beautifully designed home. This lovely contemporary, mono-pitched home was full of floor-to-ceiling glass to take advantage of the stunning views over Cable bay and the estuary. It had sunlight streaming into the home, two big in-house dogs were part of the family and the Baum’s loved their art and existing designer furniture. Each of these beautiful factors had to be considered when selecting surfaces and products for this contemporary interior space. After the initial consultation, a theme of black and white arrived. 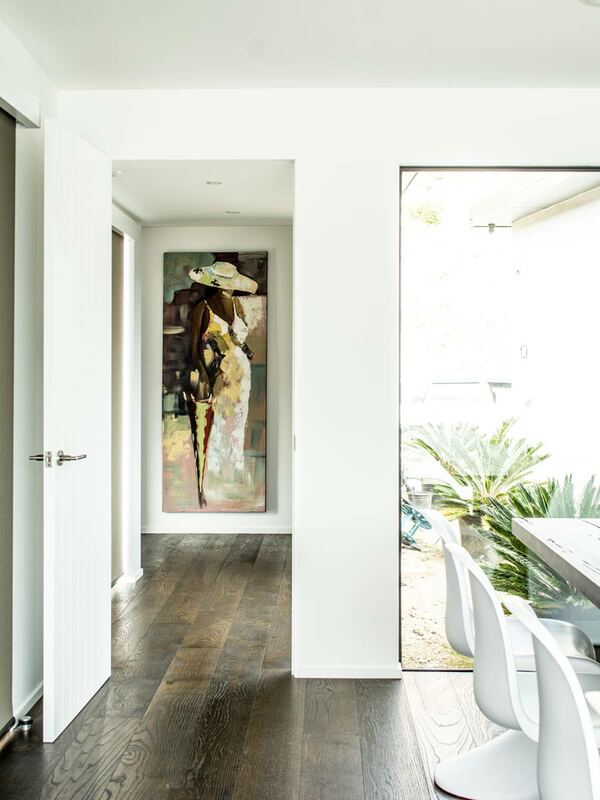 Being art and design lovers the Baums wanted different textures and liked the idea of a mixture of porcelain tiles, natural stone and engineered timber flooring to create interest. Carlton started with the ensuite and lounge floor tiles as the base starting point to begin creating the layers to this design. The Gigacer Concrete Ice large format porcelain tiles were decided upon to create a contemporary base layer of simplicity, they were used like a canvas for the rest of the textures and layers of the home to take form. Carlton was given a generic bathroom floor plan which he separated into 3 spaces, he added a spine wall to divide the shower space from the vanity suite and the toilet space was set aside from this. This spine wall needed to ground the space, so the darker Gigacer Concrete Graphite tile was selected for this purpose, it also created mood and defined the areas. 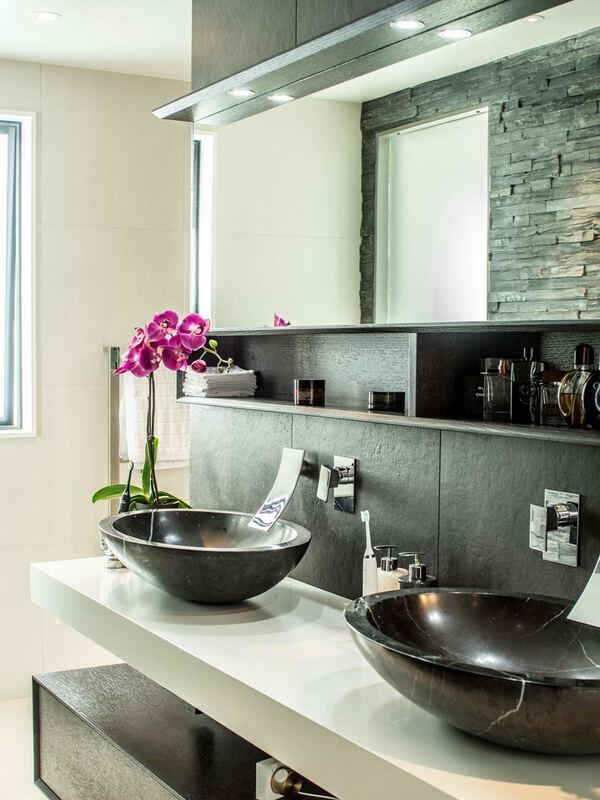 A natural split-stone stacked slate was used on the opposing wall to the vanity mirror. This wall added texture and contrast to the refined Gigacer Concrete Ice perimeter wall and floor tiles. The reflection from the mirror effectively showcases all the textures and surface layers in the room. Carlton points out the value of mirror positioning in a bathroom, many bathrooms are small or narrow and mirroring can help create the illusion of space and enhance the effect of the selected design elements. The clients wanted a touch of glamour in their own space, ensuites are a great place to really show your unique personality and flair. Carlton suggested adding a lustre to the vanity area with the combination of honed Marquina marble basins, sitting upon a white lacquered gloss shelf, alongside carbon oak cabinetry and finished with stunning polished chrome waterfall tapware. Wellness was in mind when designing the shower space. A rain-head shower created a calm atmosphere and the wall niche in the shower meant clean storage for an uncluttered sanctuary. 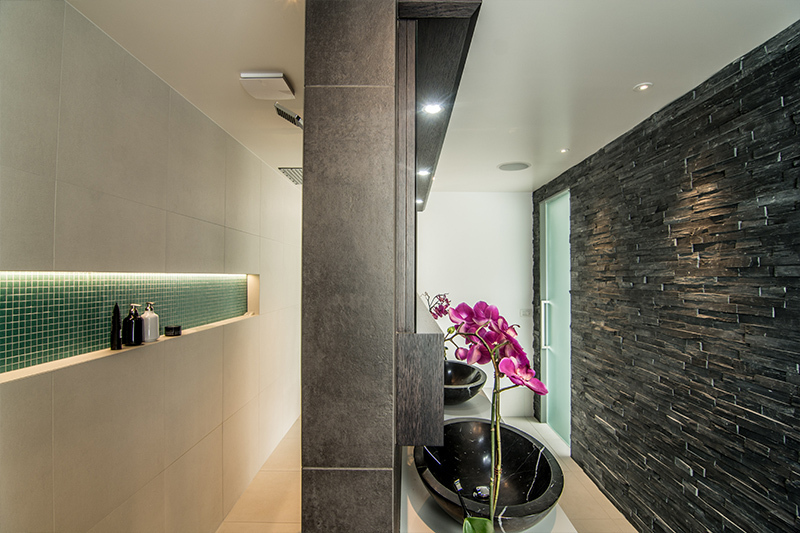 Niches are also a great area to inject colour into the bathroom and beautiful ambient lighting can be added. In this ensuite an aqua glass Pixel mosaic connects with the seascape out the window during the day and in the evening soft-lighting in the niche has a relaxing effect. A tile feature wall can introduce texture, interest and character to a space. A high variation large format slate coloured tile was selected from the Fondovalle Toko series, this was used in the lounge and master bedroom to create the perfect backdrop to showcase contemporary art pieces and furniture. The Concrete Graphite splashback tile in the kitchen added a striking contrast to the lacquered white joinery and continued the theme throughout the home. This particular porcelain tile was also an ideal choice as it's surface is super easy to keep clean, which is essential with a splashback. What surfacedesign like to create is interesting stylish spaces that are also functional and comfortable. For example the lounge wouldn’t be as enjoyable if blinding sun bounced off the white floor tiles into one’s eyes when sitting on the couch looking at the view. The mild textured Gigacer Ice tile selected absorbs light, so is softer on the eye, it is also a large format hard-wearing tile that requires less grouting so is easier to clean and maintain. The simplicity and size of this tile delivers a sense of space and adds to the contemporary look. The floor surfaces in the kitchen, dining, passage, bedroom and dressing room were finished with dark oak, heavily brushed engineered timber flooring. This brush textured surface is a great enduring choice for people with inside pets or children. Dark oak creates mood and warmth at night and is a striking contrast alongside the Ice white floor tiles. The exterior patio tile is a natural light textured tile to blend perfectly with the landscape; not too bright to blind guests at midday barbeques and not too dark to burn bare summer feet after a Cable Bay swim. 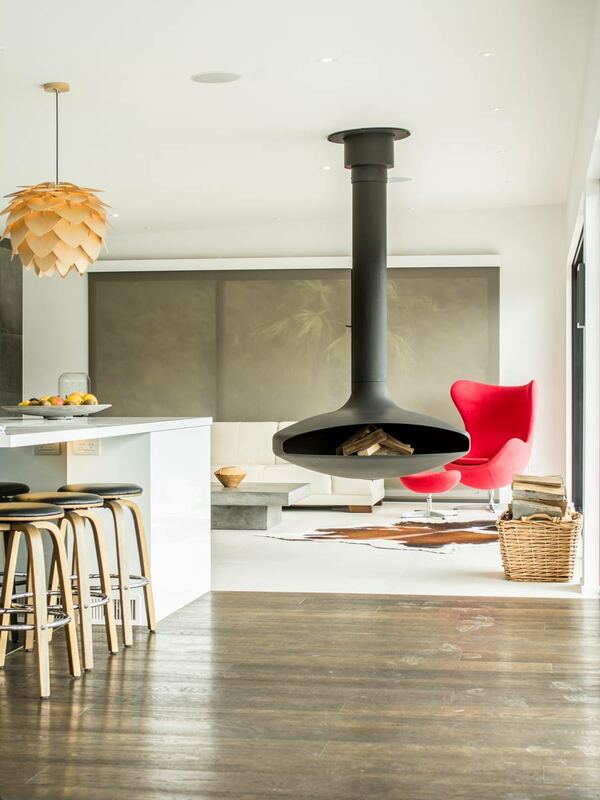 Understanding the brief of how surfacedesign clients live their lives is important to Trish and Carlton so they can design beautiful liveable spaces, that reflect their client’s desires and personalities, which Carlton got just right with this wonderful home.